I heard that this park had something that other places don't have. Something that you can imagine. A friend of mine who is a very good photographer was showing me some pictures that she took there. 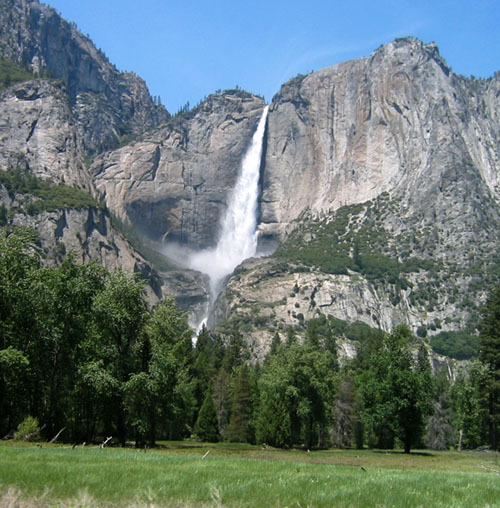 People were referring to Yosemite Park, saying it was a special place to visit and spend time, take pictures, and even to spend the night there. They told me that grizzly bears live there. So... I was looking at the pictures, and I could see how beautiful it was. My friend told me that she spent the night over there in order to take the best pictures she could. It was a very important moment for her. It was one of the best opportunities to have the best shots ever. avoid getting hungry. She said that you can't bring too much food, especially smelly food with you, or you can attract the presence of the grizzly bear. I learned that the grizzly bear is becoming more and more intelligent so he actually has learned to open doors, cabins, tents, and even some bags. If he can't open them, he just rips them, so you have to be really smart. My boyfriend, Roque, wanted to bring me there very much so one day, when we were in Fresno, he started to go straight to Yosemite Park. From Fresno it took one hour and a half to get there. It was 3:30 pm at that time. He started to drive as fast as he could, without exceeding the speed limit. By that time we were already tired after almost 3 hours of driving from San Francisco to Fresno that same morning. But he insisted so hard that I couldn't say no. And there we were driving as soon as we could to get there before the sun went down. It was winter, when the night came out at 5 o'clock, and everything fell into the darkness. We kept driving. I was like a bear falling sleep just with the first lights of the night, but he kept driving. We arrived at one of the many doors of the park at 4:30. And from there we still needed to get closer into this huge place. He kept driving, it was so cold. I started to set up my camera, and I remember perfectly: I have the moment in my mind clearly like a movie. After that, we crossed a long tunnel and I could see spectacular, colorful, brilliant, amazing images of these huge, gigantic mountains that take out your breath. I can't find the right words to describe the scene, but I can tell that you can feel thankful to be there, and appreciate this gorgeous scenery that became almost like an spiritual experience. I feel so lucky to have been there. Thank you "Madre Naturaleza" to give us just a wonderful scenery. Let's please take care of our planet.